A new private message arrived in my ADVRider email account and I opened it with unbridled anticipation. You see, the message was in response to our listing on the “Tent Space” thread where we offer food and lodging in our home to adventure riding motorcycle travellers. We’ve hosted travellers in our NH home from as far away as Australia and we’ve enjoyed every minute. We’ve generated new friendships and been able to share a bit of our country with people from other parts of the world. It turns out that this traveller was not from very far away, in fact he was from Brooklyn, NY. He was finishing up a three week sortie of the Trans Labrador Highway, Newfoundland and Nova Scotia. Awesome! The Trans Lab loop was one of our favorite rides which we had last ridden 2007. We were anxious to meet the rider, hear about the Trans Lab and what he experienced during this trip. We emailed our potential guest back and told him that we would be delighted to have him come and stay with us. We had a few back and forth contact emails and around 10:00 PM as we sat around the fire pit of our little VT getaway home, we could hear the familiar sound of a single cylinder motorcycle coming up our gravel mountain road. We left our little fire and greeted our guest Ben Recchi. What a great person. We fed him some dinner since he hadn’t eaten in quite a while and had been on the road since early in the day. We stayed up and chatted until well past midnight talking about the Trans Lab, his and our travels, where we’d been, what we’d seen and where we’d like to go. It turns out that Ben had been to many other places on a bike, including Central America more than once. To do so, he learned Spanish and was capable of communicating with the people he met. This made his journey more enjoyable and helped him share a little about himself with the communities he came in contact with. He really enjoyed Central America and said he would be happy to return. We told him about our experiences and where we had been and a little about what we had seen. We briefly discussed our trips to Ushuia, Iceland and the Trans American Trail and we all agreed that riding to different parts of the world was an excellent way to learn and share. We probably could have talked longer, but it was getting late and Ben had to get back to Brooklyn and we were pretty tired. So we all adjourned for a good night’s rest. The following morning, we chatted some more over breakfast and found that we were all also MotoGP and Formula 1 fans. Wow, another thing in common. Ben had planned to leave fairly early in the morning but when I told him that I had DVR’d the MotoGP race, I was able to convince him that he should stay a while longer and at least watch the race with us. With the remote and the skip commercial button, we could get the race watched and done in less than 45 minutes. So we sat in the living room and watched the race together, commenting on what was happening in the race and the championship, who was going where at the end of the season and all the fun things that fans discuss when they are enjoying their sports of choice. It was like having a long term buddy in our living room, not just someone we’d met the evening earlier. So after the race was completed, the victor announced and the trophies handed out, Ben started to pack for his final leg of his three week journey. We helped him load up his bike, took a few pictures of our new friend and wished him safe travels on his way home to Brooklyn. It was with real regret that I watched him motor down my driveway and onto the gravel road down the mountain back towards his home in NY. We had made a new friend and shared some mutual experiences. We found much in common in the less than 24 hours that we shared together. We broke bread together and learned about each other, all in the spirit of friendship and sharing that is brought about by adventure motorcycling. What a great way to learn about other people and shrink the planet. Although in this case Ben was not from a far away land, we did share and we did make a new friendship. We were invited to come and visit him in his home when we came by his way. Shrink The Planet, One Ride At A Time. Get out there and shrink the planet a bit, please. This entry was posted on July 2, 2012 by Ride2Adventure. It was filed under Adventure, Adventure Motorcycling, Adventure Rides, Motorcycle, Newfoundland, Nova Scotia, off road, Overland, photo, pictures, R2ADV, Ride2Adventure, Trans Labrador, Travel and was tagged with adventure, adventure bike, dual sport, enduro, kimike, Labrador, motorcycle, newfoundland, nova scotia, off road, overland, photo, photography, picture, ride2adv, ride2adventure, trans labrador highway, travel. Fantastic, what you’re doing inviting riders to your place ! You’ve started a ,private Friendship Force movement of your own. PS did you see that I signed up so I could have my own ID picture instead of a generic one ? Willy, yes we did. Congrats, we’re glad there’s a little personality with your posts now!!!!! 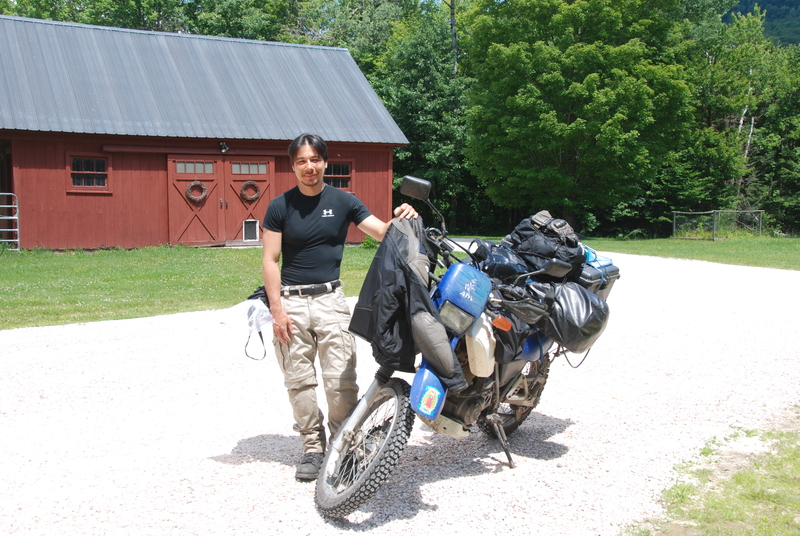 Great story, and I great idea to offer fellow motorcycle travellers a place to stop. Also love the fact that you have a fire pit, as we do also. It’s great to spend evenings sitting around the fire. Sorry for the late reply. Thanks for the kudos. The tent list is an ADV tradition of sorts and we love being a part of it. It really helps continue and grow the motorcycle fraternity. As for the firepit, it is indeed a marvelous way to spend the evening under the stars. Love this! What great Karma you’re spreading! Thanks Tamela! We think that sharing is what this adventure riding thing is all about. Thanks for dropping by and leaving a comment!